Solar power has been around for decades now, and is becoming more and more popular every year. The solar system labeling that has taken place over the years began without any type of standards, until the National Electrical Code (NEC) began issuing standards in 1984. 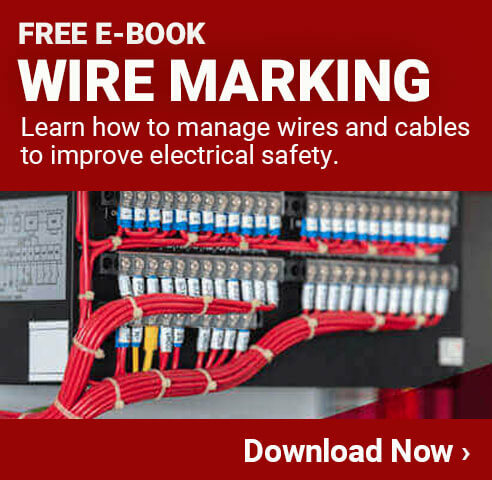 They have continued to update and issue new and improved standards all the way through to the most recent version, which was issued in 2017. Today it is necessary for all facilities that use any type of solar power to comply with the latest labeling requirements. There are different types of labels that are needed for different types of situations, and different scenarios. Solar powered systems operate in a different way compared to most other electrical systems, which is why it is so important to have a unique set of labeling requirements. The right labeling placed at the right locations will help ensure everyone knows how to properly work on, or with, these types of systems. While the risks are quite similar from a traditional electricity source to a solar source, the exact causes for problems can be very different. Having access to custom labeling, or being able to print custom labels on site, is essential for the overall safety of any facility. Just like all types of labeling and safety regulations, the solar labeling standards have been updated many times over the year. In 2017, NEC released an updated set of standards that have now taken effect. These adjustments were primarily made to help improve clarity of what companies need to do in different situations. The most recent set of updates from NEC help ensure everything is as accurate as possible, and conveys the necessary information to everyone in the area. The following are some of the key changes to be aware of. 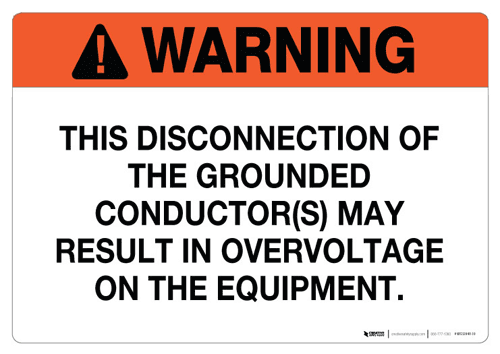 More Accurate Bipolar PV Labels - The new warning labels for bipolar PV labels must read, 'This Disconnection of the Grounded Conductor(S) May Result in Overvoltage On The Equipment.' This replaces the wording from 2014, which said, 'Bipolar Photovoltaic Array Disconnection of Neutral Or Grounded Conductors May Result in Overvoltage on Array or Inverter.' The new language is more compact and clear for the typical reader. Eliminated Labeling for Underground Systems - NEC 2017 no longer has a requirement to have a label in place stating that the system's conductors are located underground. This specifically applies to the labels that were formerly required on these systems prior to the area where they actually went underground. Power Info At Disconnect Points - Article 690.53 has been updated reduce the number of fields required on labels at PV disconnection points. The new labels only need to have maximum voltage, max output current, and maximum circuit current. Reducing the total wording helps emergency workers to get the information they need more quickly, so they can respond to potential dangers. Simplified Stand-Alone Systems - Stand-alone systems now only need to have a single permanent plaque in a visible location, which shows where the system in question can be disconnected. Rapid Shutdown Labels - Rapid shutdown labels now have two different options based on what the rapid shutdown applies to. The first option will be for systems that shut down the array and the conductors that are past the array. The second option is for rapid shutdown systems that will only shut down the conductors that leave the array. Companies need to make it a priority to remain in compliance with all NEC regulations in regards to all solar power systems. If there is an audit or inspection that takes place, and the labeling is not completed properly, it can result in serious fines or other penalties. In many cases, the inspectors will allow a company to delay their work so that they can get the labeling completed, but that can also be costly. Of course, the most important reason to remain up to date with the latest standards is to keep a facility as safe as possible. These labeling requirements are in place specifically to ensure employees, equipment, and the facility are protected from potential dangers associated with solar powered systems. Reflectivity - Some labels must be reflective, so make sure that the label stock being used meets the requirements in question. Secure Placement - Make sure that the surface where the label will be places is properly cleaned and dried so that it will be kept securely in place. 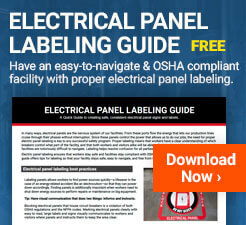 UV Resistant - When placing labels outdoors, having UV resistant labeling is critical. Since these labels are specifically for solar systems, this is more likely to be a concern than with other systems. Character Size - Most solar system labeling words need to be large enough to easily read. The standard for most labels will be 3/8'' tall. Coloring - There are a variety of color requirements for what color the labels are for solar systems, and making sure that they are correct is necessary for avoiding any type of citations. While there are some generic solar system labeling options, most things will need to be custom ordered to meet the specific requirements of each facility. Rather than paying the high prices associated with custom ordering labels, many facilities have an industrial label printer on site. This not only helps make it possible to create custom labels as they are needed, but can also save a lot of money in the long run. High quality industrial label printers can also print on many different types of label stock, which is important for compliance with NEC requirements. Whether you need reflective labels, UV resistant labels, or any other option, a good printer will be able to meet your needs.